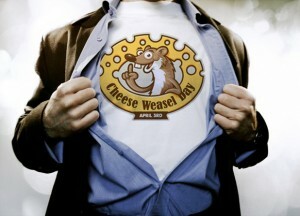 Only a few more hours until Cheese Weasel Day is officially here. Time to get in touch with your inner weasel and make plans to do something special for the techies in your lives. This year we have a lot of new free resources for you to use. Here are three ways you can share the joy of Cheese Weasel Day. First, you can slip some cheese under the mouse pad of your friends. We have created Cheese Weasel Day print-and-fold cards. Just print them up, write a personal message, put in a slice of cheese, and slip it under their mouse pad. Second send them the Cheese Weasel Song. You can go traditional, send a CWD Rap, or try this bluesy rendition on video. Pick one that suits their taste in cheesy music. Third, don’t forget, we have Cheese Weasel T-Shirts if you want to send something more substantial.